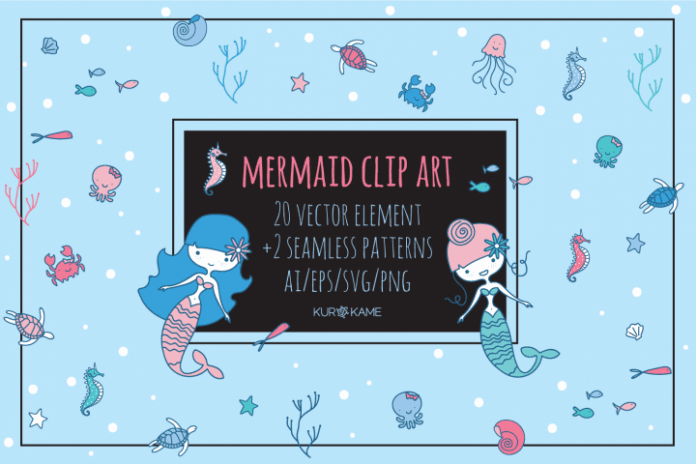 Under the sea with this lovely Mermaid Clip Art – Grab Yours for FREE! This design is perfect for making memorable Planner, notebook covers, Physical or digital scrapbooking, Party backdrops, invitations, greeting cards design, wallpapers and many more. This Wonderful Illustrations created by Fantastic kurokame contains 20 vector elements +2 seamless patterns. Every birthdays are so special with this cute and beautiful Mermaid greeting cards. Hurry and download this for FREE. Get these Mermaid Clip Art for free at designbundles.net.